Hi I'm Kerry. Voice overs is what I love to do and voice recordings are used by a broad range of clients that include the arts and aerospace, technology and healthcare, finance, lifestyle, travel and more. 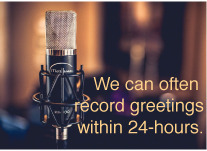 I've recorded TV and radio commercials, multimedia projects, phone greetings and am often utilized as the narration voice for training and marketing. From the “how-to” of hoisting yourself up into a semi truck correctly to tempting an audience with great deals on luxury vacations or weekly grocery bargains - even announcing the quickest way to the exit for those escaping a burning building, the topics are diverse. Recording requests come in all shapes and sizes. Please allow me to step up to the mic for your voice over or narration project. Making a recording that conveys the intended message in just the right way is key to a project's success. Whether it's communicating information about casual, lifestyle marketing materials or a complex technical topic, the ability to mold the voice style to fit the content is my goal. Finished recordings are provided as high quality audio files in the file format requested. Click below to listen to samples of commercials and narration voice styles. And be sure to call or email for a free quote for your project. When a script has been approved, it can often be recorded in one to two business days. Lengthy or extensive scripts need additional time to complete. Professional voice greetings for business phones - Recording and producing main menu and other directory prompts. Small business phone recordings welcome. A friendly response with attention to detail throughout the entire project. Recordings delivered on time. Satisfied customers. Email - Connect for a quote on your project.